Kidney Failure Research Papers explore the other body functions that get degraded due to this malfunction. 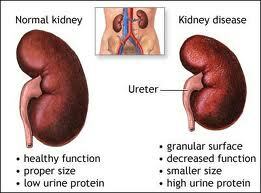 Healthy kidneys filter excess fluid, minerals and waste material from blood and convert it to urine. This, in turn, is stored in the bladder, from which is periodically evacuated. Kidneys also make hormones essential for strong bones and others necessary to adequate production of new red blood cells. While both kidneys need not be functioning perfectly--a person can survive with only one such organ--some minimum level of activity is essential to life. Given the current level of medical knowledge, chronic kidney failure is irreversible. It will eventually lead to total failure, commonly called end-stage renal disease (ESRD). Absent intervention to remove wastes and fluids (dialysis) or obtaining a suitable kidney for transplant, ESRD is always fatal. Thus, failing kidneys require some outside intervention for patients to continue life-sustaining functions. Treatment decisions cannot be made lightly. Just as the disease is life threatening, so the treatments are onerous. And they may involve life-style changes that some patients will find to much of a burden. Paper Masters writes custom research papers on Kidney Failure and explore the other body functions that get degraded due to this malfunction.